Usually we start out with some far-fetched story and long chain of events that led from last year's bad idea to this year's. But this year, we thought we'd start out a little differently and jump straight to this year's idea. When Lonnie discovered that Sara didn't actually have any friends, he felt bad and spent countless nights trying to think of ways he could help her feel better. Then after renting the 1989 Macy's Day Parade on VHS, it hit him like a double high C.
Start a marching band with her. We know what you're thinking - "how did you decide who would play what instrument?" That was easy. We decided to give Sara the flute, because it's too light for her to complain about carrying. And if she couldn't learn to play it, she could just whistle. Lonnie picked the trumpet up because he figured it was the best instrument to drown out Sara's incessant whistling. Because Lonnie's summer schedule was so busy, Sara had to attend band camp by herself. Lonnie was thoughtful enough to make a detailed daily schedule along with video and audio tapes for rehearsal. At the end of each day, she had to get one of the neighbors to sign off on her practice sheet. The whole neighborhood seemed to know when Sara was holding band camp. It's hard to miss someone high-stepping around their backyard, whistling. Some people say that it was a little too grueling for her to spend the hottest days of the year fluting around in her uniform. But deep down, she knew it would pay off. Don't worry though, Sara wasn't alone in all her hard work. Lonnie's regimen included watching the highlights of the Macy's Day Parades of the 90's. And resting. We held auditions for more band members. However, we could only afford a small number of audition flyers. We had to carefully choose which telephone poles in which neighborhoods would tell one and all about their chance to join our band. Unfortunately, no one came. There are only two possibilities; Either a rival band (we're very territorial) tore down our flyers - Or we posted the notices in "non-band" neighborhoods. Though our spirits were down after 3 days of audition "no-shows", we were able to fill our French Horn section with Kiddie. She hasn't been making much progress with her playing, but with four legs, it's like she's twice the marcher. 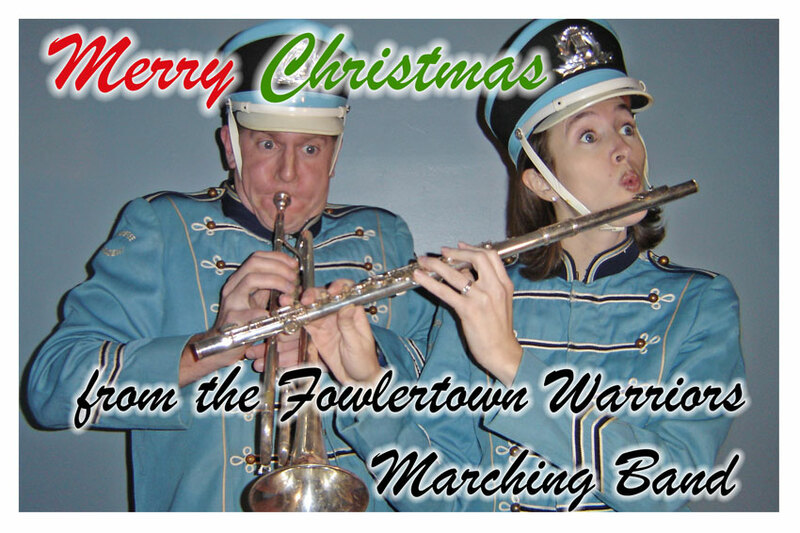 Though we haven't received any parade invitations yet (fingers crossed), keep your eyes peeled for the Fowlertown Marching Warriors. Listen To the Fowlertown Marching Warriors rendition of "Mr. Roboto"
• This was one of our favorites. • We bought the marching band uniforms on eBay. It was the most wardrobe money ($40 total) we spent on any letter to date. 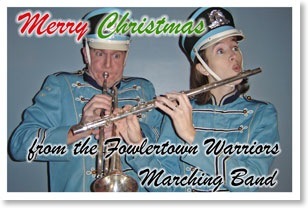 • We made "Fowlertown Marching Warrior" T-shirts for our mini-mockumentary we did.